A little history on this whole thing first. Some time ago (3 months), I posted an article on paintbrushes. 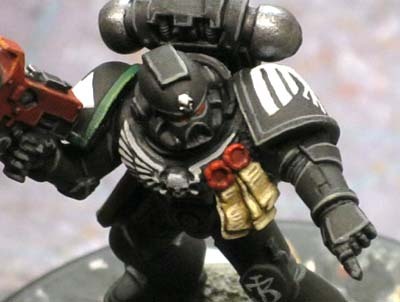 I set out to show what kind of brushes I use to paint my models so that others could see that you don't need anything fancy or expensive to get good results. The original post is right here. That quickly turned into a 2 part series on why my brushes are junk written by misterjustin. Part 1 and Part 2 can be found here for those looking to see how wrong I was in my thinking. But what did I know at the time? John from Santa Cruz Warhammer took pity on me and sent me a "high quality" brush to try. Something about coming into this century and getting with the times. Post here. Then I managed to get my hands on what I was told to be a "high quality" paintbrush. I folded and bought a Raphael 8404 Kolinsky Sable Brush - Size 0 from misterjustin. You can find them here on his site. I tried looking around online and the prices are close enough that it's not worth me going elsewhere when I know I can order from him and if something goes wrong, he'll fix it. It's about customer service for me these days. And I'm lazy, once you get my business, I don't usually stray. Three months later and I can still paint super fine details. And that brings us to today. Three months have passed and I'm still using the same brush. The same brush that looks like brand new. And it's not because I've been delicate with it either. For the first week or so, I was careful with it... but after that, I got mad at the thing and decided I was going to prove everyone wrong and wreck the thing by painting how I normally do. Mind you, I didn't go out of my way to ruin the brush, but I didn't treat it any different than my other brushes. When that wasn't working, I decided to start using it for everything (minus base work since that really does destroy paintbrushes). Three months of commission painting and the thing is still like brand new. I've got other brushes that are already trashed and I haven't used anywhere near as much as my fancy Raphael brush. Seeing that this thing is not going to break, I figured I would try and take care of it now. I emailed misterjustin to see about finding some paintbrush cleaner. He pointed me in the direction of some cleaner that supposedly makes the brushes like brand new. 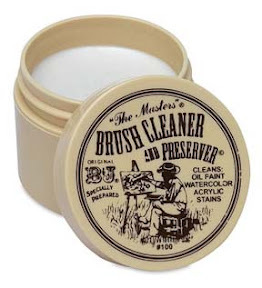 It's called, get this, "Brush Cleaner" and it's made by The Masters. Time to see if I could prove something else wrong I thought. My Wife agreed to pick some up from a craft store nearby and one night last week, I gave my fancy brush a good "cleaning" according to the instructions. I was actually surprised to see a little bit of paint and built up scum come out of the brush when I was cleaning it. I change my paint water regularly and figured the brush would be clean enough already. Then I let my brush sit to dry. I cleaned it on a Wednesday and hadn't planned on painting until Friday or Saturday. And wouldn't you know it, when I started using it again, the stupid thing was like brand new. Like I just bought the thing. I thought I was using good brushes at first, but I was wrong. I thought I could break my fancy brush, but I was wrong again. I thought cleaning it wouldn't do much good... wrong once again. Easy. If you enjoy painting and you've taken the time to learn how to do it well, then you owe it to yourself to get a fancy brush and take care of it. I can tell you that they will last and you'll not only paint a little better, but you'll enjoy it much more too. NEXT: Check out the nine month review where my brush dies... sort of. Good stuff here. I use "high quality" brushes (Winsor & Newton Series 7 or Blick Studio). I don't treat them any different, but clean them religiously with brush cleaner after EVERY painting session. It takes me a year to a year-and-a-half to wear out a good brush (And I've painted 3,000+ points/year for the last couple of years.) In the long run, that's CHEAPER than buying a couple new nylon brushes every few months like when I first started painting! I hear you Ron. Like most people, I started with Games Workshop brushes. Then I bought several Reaper Kolinsky Sable brushes on a recommendation from Jawaballs. They are fantastic. I can't express it enough. Does it work in drybrushing, or should I get a different brush for it? My favorite part is that you had a preconceived idea and then you are willing to post and not only admit yourself wrong, but be happy about it. Shows that I can trust your advice. Though I unfortunatly paint far less I've also switched to Raphael. Got the tiny brush too but I'm having a hard time using it. Also I think I need to learn to be kinder to my brushes as I load them too much and end up with paintn on the handle (I think mostly from my fingers, but still). Using the same brush cleaner plus a brush conditioner (some oily substance that really cleans things out and counter acts the drying effect of the brush cleaner). H.C.118: I have done some limited drybrushing on very small areas... I have other brushes for that though. Go with a different brush I'd say for that. Flekkzo: I store my brushes by laying them down on my desk when I'm done. They just lie there flat on my painting mat. I do make sure I shape the tip and get as much water out as I can though, but other than that, I just toss them down. I personally bought a set of Currys brushes for my work and have been using Masters Brush cleaner for about 5 months now. It at one point saved my citadel standard brush until I base coated and did the plating on 21 space Marines and a rhino. I grew tired of buying a set of cheap brushes every month. But I have to agree with your observations, a good quality brush treated right will more then pay for itself over time in regards to replacement brushes. But that is not to say citadel brushes are poor choices too. They are fantastic starter brushes and can even last a good long time if you clean them properly after every use. I also find they make ideal brushes for younger kids who may not always remember to clean the brush after use. Easier to replace a $5 brush then a $10+ one for the little guys and gals. Dammit, now Im tempted to try this, always been pretty happy with the GW ones. This hobby is an endless pit of expensive ways to improve! lol Thanks I enjoyed the article. A great series of posts Ron. My experiences were similar to yours: I just wouldn't take other's word for it, but out of curiosity about 6 months back I purchased the same brushes. I'm pretty hard on mine, so surely the good stuff would be wasted on me? The results were the same and I simply could not believe I'd been that stubbornly stupid and had persisted with cheap brushes for so long. Painting is now sooo much easier and 'smoother': I find I actually enjoy painting more now and paint slightly faster and with more control. High quality brushes make painting so much more enjoyable. This is something I learned back in AP Studio Art and I've carried it with me through to miniature painting. Don't Walmart effect the things you enjoy or you start to worry more about the money than the actual enjoyment. Ron, I'm glad you like the brushes and that the articles have been so well received. I never realized the snowball effect this might have on our community though. Thanks for the link to SWM on the brushes too - and thanks to all of you that have purchased them from me. Couldn't agree with you more on the Raphaels, got me a selection a while back and just won't give them up. Its got to the point where all the others are just used for basing, glue and drybrushing. Even considering buying a size 2 brush for basecoating. I love my Raphaels. I also like the Kolinsky Sables from Isabey. I don't like the size of the body for miniature painting on a No. 2 Raphael 8404, personal preference is a 1 or 0. The Isabey round is different, a #2 has a thinner body than the Raphael and sharp point. Personal preferences make all of the difference. I know several people that will only use the Winsor & Newton Series 7 Kolinsky, but I can not get that to work like my Raphaels and Isabeys. I've been tempted more than once to buy high end brushes, but I'm happy with my Citadel brushes. I'm just now needing to replace them after two years of use. Great post Ron, your are quiet the motivator when it comes to painting. Thanks to you I am looking into better brushes and will come to see what works best. The Raphael 8404 is, in my opinion, the best Kolinsky sable brush for the money on the market today. Wow, I didn't think I'd get such a great response to this. Charles: There's nothing wrong with other types of brushes. I think I've learned what to use when more than anything else. Cheap brushes still have their place on my desk. Mart: I'd say to try it. Maybe borrow one from a friend first to see if it makes a difference for you. Chevalier de la Terre: I too had to try it for myself. I thought I had it all figured out before I was introduced to the good stuff. Charles Feduke: You would have thought that I would have learned the same thing in art school... but I didn't. misterjustin: Thanks for pointing me in the direction I needed. It's made a big difference, but you already know that. The Pirate Viking: I went and bought a second number 0 for my work. I find it can do whatever I need and outside of that, I grab a cheaper brush to do the job. PsychosisPC: Thanks for the link, I'm going to add it into the post. oni: If they work for you, stick with them. Personal preference and comfort level are to very important aspects of this. Maverick822: I'm only sharing what I've learned. I'd say to get out there and try some new brushes. What works best for me might not for you (like the previous comment by oni... he's got what works for him). But you won't know until you try and that's worth it. It has been for me for sure. I usually buy Red Sable brushes from my local art supply store, I am not sure they are Kolinsky being that they are made in Shri Lanka but they do a good job and because I keep them clean and don't overly abuse them I get about a year out of a brush. However when this lot is ready for the drybrush stack I will for certain be trying out some from Secret Weapon, because the reviews I am hearing make it worth a try (and at only $2 more expensive well the difference may be worth it). Based on this post, I went ahead and purchased the brush from SWM. A while back, I broke down and bought a more expensive brush from my FLGS (Game Vault) that, while didn't hold up as well under the abuse, did manage to perform better than the cheaper ones I had been using. Thanks for the brush tips and articles, Ron! My thanks go out to everyone that decided to purchase a Raphael brush from SWM. When I went to look at the orders yesterday I knew right away that Ron must have posted his brush article follow-up. Thanks again - and I'm glad that my part of the brush article series has been helpful. Don't worry Mr. Justin, there is more brush buyers out there. I will be purchasing mine very soon. Thanks for the write up too Ron. It always helps to get advice from others in the hobby on and off the site. Thanks again for all the help. This has to be one of my favorite brush articles so far. I have found that so many people swear blind by the rapheal brushes, but don't give any real comparison. Honestly, I have felt my brushes have been holding me back. I am not ready to get in there and get myself some posh brushes! Bryonis: Thanks for the comment. My brushes were holding me back as well. Once you get a nice one, you'll never go back. In fact, I always buy and have one new one waiting to go when I do decide to "retire" my front line brush to secondary work. I need to buy new brushes and need a good set. As I will buy models and paint from Wayland I can as well buy brushes too. Can you recommend sizes? I will paint Tyranids. Thanks! My primary paint brush is a size 2,sometimes 1. 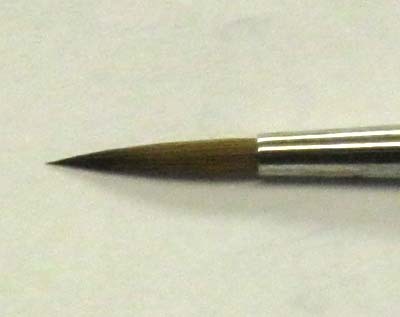 A good sable brush will hold a needle point so you can paint with a larger brush. As a professional painter I have been using series 7 brushes fir a while now and am looking into several other brushes to do a run for down of high end brushes to see which ones IMHO paint better. I do have to disagree with Mister Justin on his article comparing W&NS7 and the Raphael 8404. Series 7 have always run small and that fact is pretty well known so to get a good comparison the size 1 Raphael should have been compared to a size 2 w&n, which would make them almost identical.